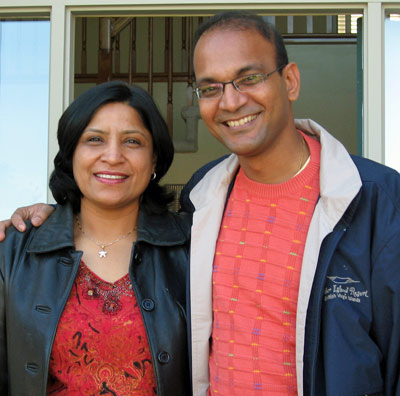 Chetan and Vineeta are both originally from India, and came to the U.S. to pursue advanced degrees and challenging careers. Chetan, who ultimately earned three advanced degrees, worked his way up to becoming the engineering manager of a large automotive manufacturer. He was looking for a few sound investments to make the most of his money and asked a colleague for advice. His colleague then introduced him to an opportunity to start his very own business with a low startup fee and unlimited income potential. Meanwhile, Vineeta had just earned her MBA and had landed a dream job as chief financial officer of a small company. She was looking for supplemental income to help pay off her student loans. She valued her older sister’s opinion and asked her for advice. She wasn’t sure at first that she wanted to start her own business, but out of respect she listened. After all, she knew she would be able to get her business started in her spare time. The Rastogis have settled in Troy, Michigan, with their son Aneesh, not far from the jobs they once pursued. Today they love having the flexibility to indulge their love of travel. They return often to India, and also enjoy annual trips as a family to Hawaii and the Caribbean. As the Rastogis have achieved success in their business, they also give their time and energy to support worthwhile charities. They are especially active supporting Easter Seals and the U.S. Dream Academy due to the programs these organizations have developed to meet the needs of children and returning veterans. The Rastogis truly understand the value of helping others and have made it a priority in their lives. The Rastogis exemplify great attitudes, professionalism, love, and dedication, and through their business have developed phenomenal leadership and interpersonal skills. They came to the U.S. with a goal to achieve the American dream; today, they share this dream with others around the world, wherever their journey takes them.